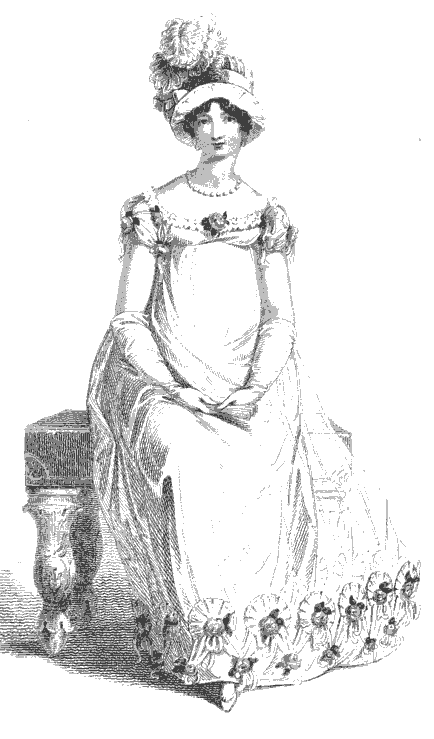 A round dress, composed of jaconot muslin, embroidered in small roses. The skirt is finished round the bottom with a profusion of rouleaus of clear muslin, which are fancifully wreathed with white satin. The body fastens behind; it comes high on the shoulder, but is cut very low round the bosom and back of the neck. The front forms the shape in a most becoming manner. Plain long sleeve, finished at the wrist to correspond with the skirt. Head-dress, cornette a la Ninon, composed of tulle and rouleaus of pale green satin. The crown is decorated with a wreath of leaves in pale green satin, to correspond with the rouleaus, and a broad lace set on very full. The cornette fastens under the chin, and has a full quilling of lace all round. The hair is parted so as to display the forehead and eyebrows, and dressed very light at the sides. Necklace and ear-rings, white cornelian mixed with gold. White kid slippers and gloves. A plain rich white gauze dress over a white satin slip. 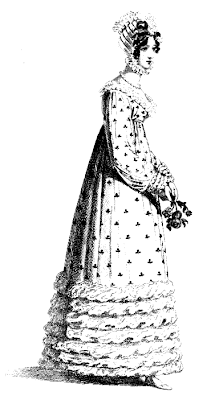 The form, a frock made to fasten behind; it is cut very low all round the bust, and the body and sleeves are ornamented, in a style of uncommon novelty and taste, with blond and moss-roses. The skirt is elegantly trimmed with gauze draperies, each of which is finished with a rose. Head-dress, the chapeau a la Infanta; it is composed of white satin; the crown a moderate height, elegantly ornamented with satin round the top. The front, which turns up all round, is of a novel and becoming shape. A beautiful plume of feathers droops a little to the left side. The hair is dressed in loose curls on the forehead, parted in front, and very low at the sides. Necklace and ear-ings, diamonds. White kid gloves, and white satin slippers. White crape fan, richly embroidered in silver. No. 1. White straw bonnet, round crown, a moderate height; the brim is very deep. The trimming is plain ribbon, of which there is a large knot on the summit of the crown, and a bunch of fancy flowers placed on one side. No. 2. A capote of cambric muslin, of a similar shape to the one just described; it is trimmed very elegantly with rich worked muslin. The brim is edged with two rows, set on rather full. The lower part of the crown is finished by van dykes of work, and the top is ornamented with a fulness of work before and behind. A full band of soft muslin ties it under the chin. No. 3. A second capote of perkale, which is laid on in plaits. The crown very low. The brim a moderate breadth, but very wide. Both brim and crown are trimmed with a double row of pointed work. White sarsnet strings, fastened inside the bonnet, tie it under the chin. No. 4. White straw bonnet, trimmed with a scarf of dark green silk, with a stripe of coquelicot in the border. This scarf is disposed in a very full rosette, and finished by long ends. A green and coquelicot striped ribbon ties this bonnet, the form of which resembles the one we first described, under the chin. No. 5. A capote composed of striped muslin. The crown is oval and low; the front is deep, and comes down square at the sides. At the back of the crown is a piece of the same material set in very full, which quite shades the back of the neck; it is tied with soft white ribbon, and ornamented with bunch of wild flowers. No. 6. 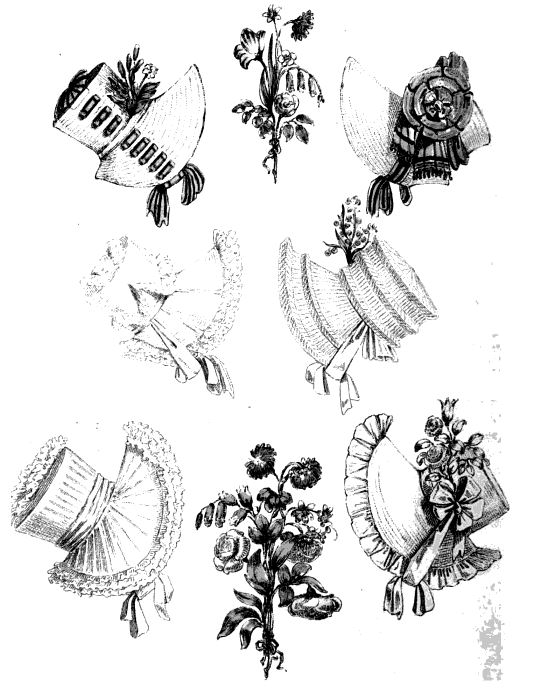 A bonnet, composed of yellow crape, the crown of which is very low, and the front enormously large; it is trimmed round the brim with a fulness of yellow crape, ornamented with a bunch of yellow crape roses and a very large knot of yellow ribbons: it ties under the chin with ribbon to correspond. The small bunch of flowers consists of tulips, pinks, narcissus, and roses. The large bunch is composed of roses, narcissus, blue-bells, and poppies. all of which are at present in high estimation among the Parisian elegantes. 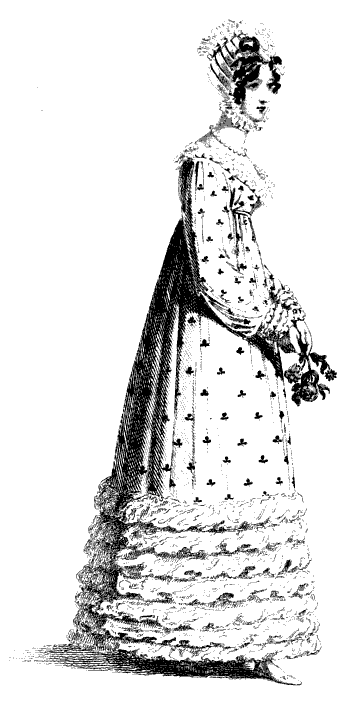 A jaconot muslin round dress; the bottom of the skirt trimmed with five rows of embroidery, in a running pattern of leaves. The body is full; it is cut low round the bust, and the fulness is gathered in there and at the bottom of the waist by a narrow band of muslin. Plain long sleeve, almost tight to the arm, and finished at the wrist with work. 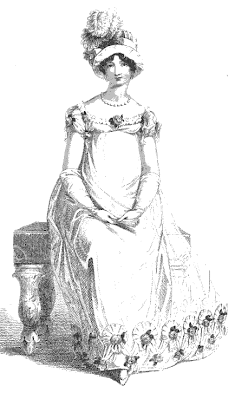 The fichu worn with this dress comes up very high on the shoulders, and partially displays the neck; a pink and white net silk handkerchief is fastened in a large bow and long ends before. Head-dress a bonnet composed of white satin, and lined with the same material: the brim, which is very large, turns up entirely in front; the edge is ornamented with intermingled rolls of pink and white satin. The crown is also adorned with rolls of pink satin, displayed in a very novel and tasteful style; it fastens under the chin with a knot of pink satin at the left side, and is finished by a rich plume of down feathers. Blue kid sandals, and white kid gloves.